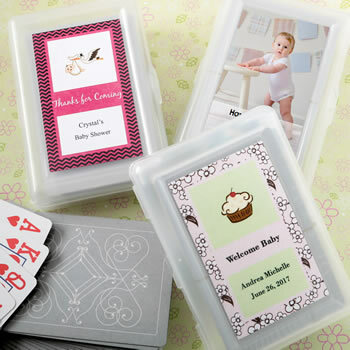 Deal your guests a great hand at your next event when you offer them a pack of playing cards as a gift. They can be personalized with a customized label of your choice to match the theme of your event. This is a full deck of playing cards that have a light silver top with a geometric and curlicue design. They are packed in a molded plastic case that opens like a book to reveal the playing cards inside. The durable case protects the cards for long term use. The inset in the case is perfectly sized for you to apply a customized label, designed by you, in colours and themes to match your special event. The labels come on pre-cut sheets and are easy to peel off and stick onto the inset of the case. These playing cards make great favors for weddings, showers, anniversaries, guys events, birthdays and other grand occasions. Size 2.5" x 3.75" x .075"
Please note, the actual playing cards will come standard and are not personalized. SIMPLE ASSEMBLY REQUIRED. Cases do not come with sticker attached.